Bolton, Herbert Eugene , “Rim of Christendom: a Biography of Eusebio Francisco Kino, Pacific Coast Pioneer ,” Arizona 100: Essential Books for the Centennial, accessed April 21, 2019, http://speccoll.library.arizona.edu/online-exhibits-dynamic/az100/items/show/178. The first complete biography of one of the major players on the stage of the Spanish borderlands. Eusebio Francisco Kino (1645?-1711) was more than just an Italian-born, German-educated Jesuit in the service of the Spanish Crown. His manuscripts arguably constitute the best contemporary record of the Pimería Alta, where he worked. Bolton searched exhaustively for unpublished Kino material in writing this account. 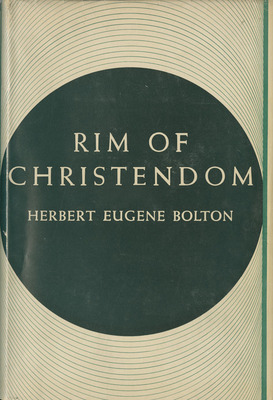 The extensive text is intertwined with discussions of Bolton’s own journeys in Kino’s footsteps. New York : The Macmillan Company, 1936. Reprint, New York : Russell and Russell, 1960; Tucson : University of Arizona Press, 1984.
xiv p., 2 ℓ., 3-644 p. plates, fold. maps, facsims. 24 cm.